If you ride like lightening, you’ll crash like thunder. With as much speed and adrenaline as handsome Luke’s motor riding, The Place Beyond the Pines navigates a complex trail of twists and turns that creates an unavoidable crash course in fate. After I stumbled upon the first poster of The Place Beyond the Pines last year during the Toronto Film Festival, there was little to scrape off the surface except a tatted up Ryan Gosling holding a baby. The mystery behind the film continued for months until initial trailers surfaced stirring an understandable misconception–is this Drive 2.0? While Gosling’s character has similar traits to his role as the Driver (mysterious nature, quiet demeanor, strikingly badass), this is not a recreation of Drive. A couple years ago we saw the heart-wrenching debut of relatively unknown writer-director Derek Cianfrance with Blue Valentine. Re-teaming with Gosling, Cianfrance’s sequel project with the actor boasts a heavy script with a well-rounded cast of grade-A performances. 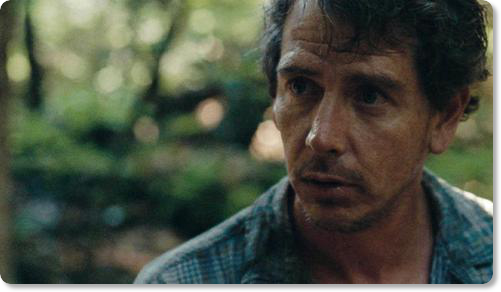 Oscar nom for Ben Mendelsohn? The Place Beyond the Pines unfolds in three acts, all intertwined and all focusing on the relationship between father and son, the question of morality and the length of how far the main characters will push the law to provide for their families. The first act focuses on Luke (Ryan Gosling) who rides back into Schenectady, New York, where he runs into Romina (Eva Mendes), a one-night stand from a year prior. Luke discovers Romina gave birth to their son Jason, and Luke is determined to take control of his life to provide for them at any cost. Bank robbing becomes the best solution after Luke meets Robin (Ben Mendelsohn) whose past history with bank robbing has never gotten him caught. After a couple successful bank robbing stints with quick getaways, Luke’s error-less streak comes to an end when he comes face to face with rookie cop Avery (Bradley Cooper), which is where the film takes a jarring pivot into act two. The second act screenshots Avery’s rise in the police force, and his relentless drive to provide for his wife Jennifer (Rose Byrne) and infant son AJ. The morality of good cop vs. bad cop is presented to Avery whose moral compass becomes skewed by another corrupt cop on the force, played by the ever-smarmy Ray Liotta. This all influences act three, which fast forwards 15 years later…but it’s best to go in knowing little about the final act except the connection between Luke and Avery has a unique twist of fate involving Luke and Avery’s sons. There is no apparent “villain” in the film, at least not expressed by the film’s director. Both characters struggle with how to provide for their families and to what extreme they’ll go to solidify their families’ financial safety. Andrew at FilmSchoolRejects.com summarizes this internal conflict perfectly. But while the good vs. evil concept may become monotonous at times, particularly in the second act that tends to drag in it’s quest for righteousness, one facet of the film remains strong from start to finish–the acting. Ryan Gosling has been Academy Award-worthy for over a decade, and has only recently broke into mainstream appeal (With the exception of The Notebook, his roles following were mainly indies with exceptional performances). He’s only in a fraction of the film, but his moments on screen are some of the most electric shots in the film…even the way his character looks at Eva Mendes has a James Dean appeal. Bradley Cooper proves his recent success in Silver Linings Playbook was no fluke–his credibility as an actor continues to rise with this film. And Eva Mendes? The girl can act! She’s been around for a while, but she’s never had any role that has genuinely solidified her as a good actress–Place Beyond the Pines gives her that accolade. But the real surprise actors in this film are AJ (Emory Cohen) and Jason (Dane Dehaan) who play the sons of Cooper and Gosling respectively. The two play confused, reckless youth whose fathers past mistakes influence their futures. I wasn’t convinced with Cohen’s character or his slummish demeanor coming from such a highly-influenced family, but Dehaan’s performance is one to lookout for. Place Beyond the Pines is an ambitious film–probably the best of the year thus far, but it didn’t garner a perfect score on my end. While there was a lot of meat to this film, Cianfrance bit off more than he could chew translating his screenplay onto the big screen. It’s overall a good watch and worth checking out as it will likely resurface around award season. Was anyone else reminded of this? Good review! Hadn’t thought about the lack of villain. That image with Kiefer Sutherland, is that from Lost Boys? I think I actually prefer Pines over Drive. Love love love the Drive soundtrack, but didn’t really care for the Driver after what happened in the elevator. Whereas I did care about characters in Pines right up to the end. Haha, yes, that’s Kiefer from Lost Boys. The scenes of Gosling and Mendes reminded me of Sutherland and Gertz motorcycle riding. I definitely cared more about Gosling’s character in Pines, but found the overall product of Drive more enjoyable. It’s a good movie with some amazing performances, but I still can’t help feeling like I left this movie with more negatives than positives. Regardless, it still had me riveted at times. Nice review. 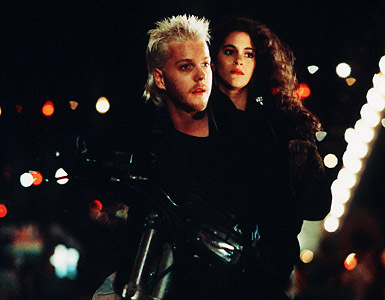 Anything that reminds you of the Lost Boys is one I’ll go see……loved that flick. Only a scene, and I was slightly joking…don’t get confused! Great review! I’m still willing to give this one a chance, but the show times at my location are kind of ridiculous. Just late night ones. I may have to wait for the DVD. I would give it a shot in theaters. It’s one of those movies you may appreciate more on the big screen (Or if you’re like me, you’ll be less distracted not watching at home). Stunning review and a great insight into a complicated but thoroughly entertaining film. My inferior review is here: http://thenumber-eightytwo.com/2013/04/27/review-the-place-beyond-the-pines/ if you care to take a quick look. Unfortunately I haven’t been able to see this yet. No where near me is showing it but I loved your review. Definitely going to check this out once I get the chance. Gosling is on a role. Only God Forgives is another one that looks fantastic. Thanks! Gosling is on a roll, and he’s by far the best part of Pines. I think everyone who’s seen it can at least agree to that. I am definitely looking forward to this movie. It sounds like an excellent, albeit flawed, film. I agree with almost every point you raised in your review but I still think I ended up enjoying it a bit more than you did. The fact that the film ‘bit off more than it could chew” was actually one of the things I enjoyed about it most. I left the theater with extremely positive remarks on the film, but the more I digested it, the more i let the minor details bug me. Glad you liked it too! Haven’t seen this yet but I never would’ve thought there’s any similarities w/ The Lost Boys. Well, as I’m not a big fan of any of the cast member, I might just give this a rent one day. Thanks! I think this movie was heavily reliant on the actors who were cast, because they carried the film through the plot holes. I agree. Still, Cianfrance is a huge talent and I look forward to his next venture.